Today my patience was really being tested by my two angels. When I managed to get the younger one to take her afternoon nap, I quickly get started with the cookie making. And today I made Almond Cookies for my mum. I got the recipe from someone who shared it at Resipidot.net. The cookies turned out really crunchy and yummy. I brought it to mum's earlier and my sis in law tried and gave good remarks .. ;-) .. she said it was nice. Add egg yolk and vanilla essence and beat again. Then add in ground almond and self raising flour. Roll dough and cut into desired shape using a cookie cutter. Cool and then keep in air tight container. Wah banyak lah kueh!!!! I want!!! Well me dah buat tapi nampak botol tu macam surut aje see lah maybe this week. 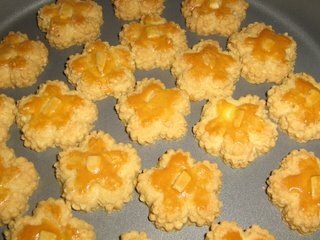 Cute lah your almond cookies, is that the flower shape?